When two worlds meet. Past and present. Or perhaps the evil against the good. One late summer day near Carl fortress at Marstrand makes a visiting school class a horrible discovery. The corpse of a woman in medieval clothes and without head found at the old sacrificial stone. Shortly thereafter be Mrs. Wilson in his garden, his life's shock when she sees the head, at the top of a trellis with roses and sweet peas. When Karin Adler at Gothenburg police are informed by his colleague Robert enjoys her of her last vacation day. She has separated from her partner George and now lives aboard his boat in Marstrand. The woman at the sacrificial stone turns out to have belonged to a group medeltidslajvare who engaged in role-playing at the remote St Erik's park at Marstrand. That you are dealing with a very cold calculating perpetrator is clear when the forensic examination establishes that the headless body, not associated with the discovered head. Soon discovered a similar case in Trollhattan, followed by two more dead men. Oddly enough, the victims also had their noses removed. 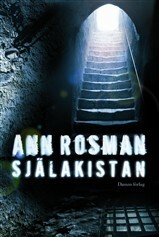 Ann Rosman born 1973, lives in Marstrand. She has two degrees, in economics and technology and was previously a consultant with responsibility for business before she began writing novels. She is an avid long-distance sailor and loves Evert Taube. Ann has a great historical interest and much research in Marstrand's exciting past. Soul coffin, the standalone sequel to four-masted daughter is published in Dust publishers. Available where books are sold, is also available as audio book and MP3.